Once I started to see trailers for Prometheus, I became interested in seeing the movie. I heard that it was a prequel to Alien, and then that it wasn't really a prequel, but it takes place in the same universe. I finally watched Alien for the first time the night before I saw this one. I saw definite connections between the movies. Two scientists, Elizabeth and Charlie, discover a cave painting. Four years later, they are part of the crew of a space ship traveling to a distant planet where they hope to find answers about the creation of man. When they reach their destination, a team goes out to explore a structure. What they discover raises more questions and puts them in incredible danger. I saw the movie in 3D because of the start times. It was fine, but I don't think it was really necessary. The Weyland Corporation is funding the trip, and there could be ulterior motives. The ship, the Prometheus, looks more advanced than the ship in Alien in some ways, like in the bridge. Other areas of the ship, like the dining area and air lock, look similar to the other ship. Things in the structure resemble things from the first movie. It seem clear to me that a few things are the same, creating a connection between the movies. Things get resolved by the end of the movie while also leaving a few things open for the possibility of another movie. There is violence in some scenes, and some disturbing things as well. The movie wasn't as violent as I had thought it would be before seeing it though. There is some tension to certain scenes and horror elements without it being a full on horror movie. 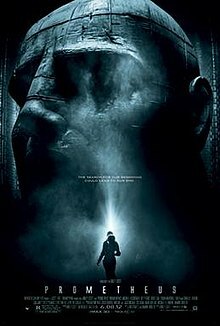 I think it works well and is a very good, entertaining movie, though some people may not think there are enough connections to Alien. The effects are very well done, and give the movie an amazing look. The characters are interesting, though some aren't developed that much. Meredith is a representative of Weyland, along to make sure things go according to plan. She is a bit cold and detached, and she tends to sort of lurk around. Charlize Theron is good in the part. Elizabeth is a strong, determined woman. In some ways, she does remind me of Ripley, though the two aren't the same character. There are some definite differences. I think Elizabeth makes a good main character. This is a very well done movie that is very entertaining. I'm glad I decided to see it, and that I watched Alien before it. The movie is definitely worth seeing. Great .. looking forward to it today ..
Hope you like it. It really is a great movie. I saw it today and liked it very much. I made a strong effort to keep expectations in check, which we apparently successfully. Michael Fassbender is very good in his role, bringing across the character just right. Having Patrick Wilson in the same movie is not a good idea , it took me a moment to realize it's not Fassbender Guy Pearce is pretty much unrecognizable; rumor has it there are scenes with him at a younger age that were cut (why else wouldn't they hire an actual old man). I had watched Alien on Sunday to t in the mood, so the slow build up merely matched that film and was not annoying. Once the s#*% hits the fan things move really fast. I thought the whole philosophy of the movie was quite interesing and the ending fit that very well. I can't quite make outvwhat David was trying to do. Why did he infect the young scientist? Was he anticipating that the girl would get impregnated? I don't see how those actions could have been of benefit to Weyland. The squid thing was really cool. And it didn't occur until she went back to the operation room that these things come out small and then tend to get big. The idea of our "makers" being aliens who then think of a reason and try to get rid of us again was interesting. Now how will tis go on? (Ridley said he could imagine to possibly make two more.) Eveyone is dead and Eizabeth went the other way. So who will start searching next? Just some random person at Weyland? I'm still not sure of David's motives either. It sort of seemed like he was specifically looking for that thing that he took back. Maybe some of the stuff he was reading inside that structure and ship mentioned what else was there. Hmmm. It does seem like David had his own separate orders from Weyland to do whatever he had to do to find one of those aliens alive so Weyland could ask to be saved..or to not die. Maybe David just wanted to see what would happen if someone was ...infected. I don't think David specifically targeted Charlie..he was just handy, so therefore, I don't think he was thinking that Elizabeth would get pregnant. Though later he didn't seem surprised by it. Sooo..hmm. Not sure on that. David spent the time on the journey learning....so maybe it was just him trying to learn more again. I don't think he would have known ahead of time what they were going to find there. That squid thing freaked me out. I never expected it to be that huge. I do wonder if it would have still turned into that if Elizabeth hadn't removed it...or would it have been one of the other aliens. That alien there at the end that came out of the other alien was bigger than I expected too. It looked pretty full size to me..but then again, that other alien was really huge too. I agree, the idea of our makers being those aliens is very interesting and intriguing..and why they then developed that ...weapon that spawns the killer creatures. I haven't seen Resurrection...so I don't know. I've still only seen Alien. But I did notice a lot of things that were similar. I didn't expect Meredith to get flattened by the crashing spaceship...not that I exactly liked her or anything. Just didn't see that coming. I've read things about how they have ideas for more movies..it has been hinted that any future movies wouldn't be heading toward the events in Alien. Maybe the next movie would be following Elizabeth and David and her search for where the "makers" came from. I wonder if David gets his head reattached someway...and if she ever trusts him after everything that went down.
. if the movie make senses or doesn't like the TCM remake prequel. The effects are very well done. I read something about how Scott did as much as he could without CGI. I don't think there is an overload of the CGI...none of that weird slow motion nonsense. No jerky camera work. I don't think the editing was too fast..no headache for me. The cast is really good. Guy Pearce, Charlize Theron, Noomi Rapace, Michael Fassbender, Idris Elba...They all did good with there parts. I didn't recognize some of the others, though that didn't bother me since they handled their parts well..and some of them weren't in as many scenes. No trace of hip-hop music anywhere. I don't remember anything with lyrics..just instrumental. The score really compliments what is happening and doesn't distract from the movie. It does remind me a bit of the score from Alien. I think the movie makes sense. Yes there are one or two things that I still haven't figured out - mostly the motivation of one character - but I think things make sense and are handled well. This movie is telling a story that isn't directly connected to Alien..but there is still a connection there. The things that do tie in to Alien make sense. At least I think so. Of course, I've only seen Alien once. I agree with the answers Marie gave to your questions. I will be very curious to find out how you like it. I am considering seeing it again in 2D, the 3D glasses really annoyed me again yesterday (I wear glasses anyway,so the 3D thingys are almost on the tip of my nose ). I always find it weird that now we can get the film so fast after their theatre release considering how it was long to get them during most of the VHS ERA (except for the last years as the releases were as fast as they are now). I saw it in 3D too...just because of the start times. It was playing in normal digital only 2 times a day. So sort of forced into the 3D. Not that the 3D was bad...it just seemed not needed to me. That's ok..I'm in no hurry to see that one..I've read several reviews about how bad it is. And I have a general idea of what happens from stuff I read. Maybe when I see the movie again I'll have more ideas on the motivation of the one character. Maybe part of it is like what happened in Alien. Weyland corporation had the ....secret agenda of getting their hands on a living alien specimen no matter what.. So maybe David was just being like Ash when he ignored Ripley about the quarantine and let them back in with Kane and the facehugger thing. Peter Weyland's main objective seemed to be to avoid death by convincing the ...."creators" to do something to change that. Oooo.... new thought.. maybe he wanted alien specimens so if they did that for him, he'd then be able to recreate something in the lab - or his scientists would - and then he could sell it..the ultimate fountain of youth. I hope you like it once you see it Jimmy. I know what you mean about the speed of the releases too. I remember it taking years for some movies to hit VHS. I remember for a while too, a movie would come out to rent, but then it would be a few months later before it was available to buy. As it is now, the movies are out a few months after they are in theaters. I remember for a while too, a movie would come out to rent, but then it would be a few months later before it was available to buy. I remember that Henry : Portrait of a Serial Killer cost me 65$ when I got it on VHS and it isn't one of the most expensive I got... By exemple I Spit on Your Grave cost me almost 100$. I think the most I paid for any VHS was $24. I remember seeing some that were way higher though. Likely, but if that is all it is then it seems a little uninspired. Anyway, I think I prefer your previous approach to this, that he was simply curious and wnated to find out more. Then again... Maybe he didn't like being put down all the time (there is several mentions that he is not human and even that he doesn't have a soul), so maybe some revenge factors in as well...?